Photo by Miguel Cordova © Spirit of the Desert Productions. 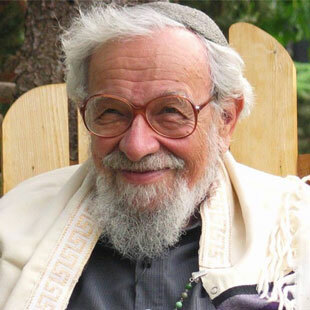 This e-course aims to bring to life the legacy of Rabbi Zalman Schachter-Shalomi (1924 - 2014), respectfully called Reb Zalman, who was one of the spiritual masters of our time. He was both a product of and contributor to the movement from religious parochialism to universalism. His devotion to paradigm shift gave birth to the Jewish Renewal movement, as well as to the Spiritual Eldering movement. He might also be considered the Johnny Appleseed of the spiritual awakening that began in the mid-20th century and continues to this day. Through his countless contributions and insights into the unfolding of shifts in consciousness and practice, he inspired a generation of seekers: first in the changing landscape of the American Jewish world and then beyond the boundaries of that tradition to multifaith communities. The seeds he dropped along the way continue to sprout and blossom in ways he may never have imagined. Reflections on and quotations from Reb Zalman's life and teachings. Stories about Reb Zalman from those who knew him. Practice suggestions designed to help you bring this wisdom into your own spiritual journey. A recording of a one-hour teleconference with presenters Victor and Nadya Gross that was held on November 19, 2018, during the first offering of this course. Rabbis Nadya and Victor Gross are delighted to offer this e-course in honor of their beloved teacher and mentor, Rabbi Zalman Schachter-Shalomi. They received joint Rabbinic Ordination from Reb Zalman and the P'nai Or religious fellowship in 1998, recognizing their unique relationship paradigm. Rabbi Victor Gross serves as faculty and Director of Studies in the ALEPH Rabbinical Seminary, where he chairs the department of Philosophy and Jewish Thought. He is also a member of the faculty and Academic Affairs Committee of the Fox Institute for Creation Spirituality. Victor is a co-Director of the Sage-ing® Legacy Program and also serves on the faculty of the Anamcara Project of the Sacred Art of Living Center for Spiritual Formation in Bend, Oregon. He is the author of Educating for Reverence: The Legacy of Abraham Joshua Heschel. Rabbi Nadya Gross is the Director of the Hashpa’ah: a training program for Jewish Spiritual Directors in the ALEPH Rabbinical Seminary. She transmits the mystical teachings passed down from her grandmother in a two-year wisdom school: Secrets My Grandmother Told Me. Nadya developed a program to train End-Of-Life Doulas, is a co-Director of the Sage-ing® Legacy Program. and serves on the faculty of the Anamcara Project of the Sacred Art of Living Center for Spiritual Formation in Bend, Oregon. She is the co-author, with Rabbi Malka Drucker, of the forthcoming book: Embracing Wisdom: A Handbook for Sages. Together, Nadya and Victor share a pulpit at Pardes Levavot: a Jewish Renewal Congregation in Boulder, Colorado, and have recently founded Yerusha (Hebrew: legacy), an organization dedicated in part to carrying Reb Zalman’s legacy into the future. Nadya and Victor are delighted to share their love and appreciation for all that Reb Zalman contributed. Please join us in this journey of discovery and practice.